My father went to Hamilton College, a small liberal arts college in Clinton, New York. Just to confuse people, not far away in Hamilton, NY, is Colgate University, another small liberal arts school. But, no — my dad went to Hamilton. As did my uncle. As did my oldest brother. Hamilton College was so formative for him. He has nothing but good words to say about the school. Let me share, though, words that others have written to him about his Hamilton College experience. 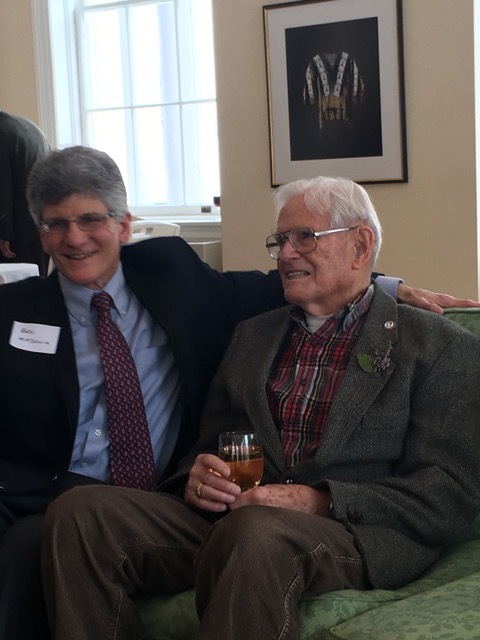 As the first member of your family to attend college, you, followed by your brother, Stewart ’54, attained prominence in your chosen field and remain an inspiration to all, especially our “first-gen” students who comprise 15% of the student body. Ben Madonia, Director of Planned Giving at Hamilton, came to visit my father last summer. Ben wrote a follow-up letter to my father, reminding him of the various Hamilton College-related stories they had shared. I thought it was a brilliant idea to recap the visit to help my father remember. Of course, I can’t find that letter to include an excerpt, but Ben also wrote one for my father’s birthday celebration. … You and Elinor were among the first to greet and welcome us into the Hamilton alumni community at Achievement Day in August of 1980. We have been forever grateful to both of you for your kindnesses to us and for all that you have done for Hamilton. 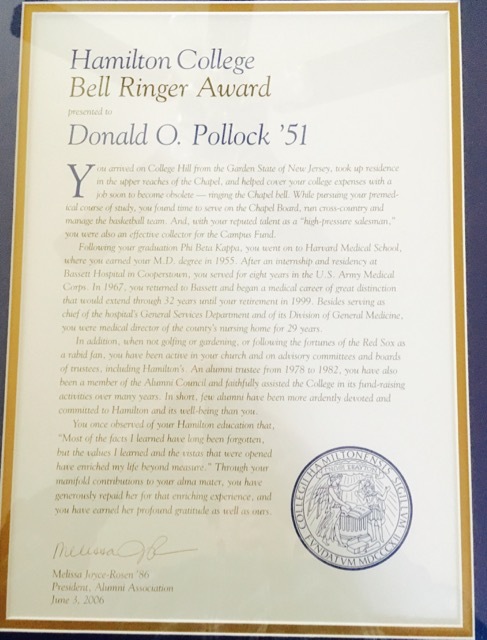 He went on the mention my father receiving the Bell Ringer Award, one of Hamilton’s highest honors. Dad has that award framed and hanging in the dining room. Last fall, one of my father’s friends drove him to Hamilton College and he climbed the stairs of the bell tower once more. … Don, I really appreciate all the help and advice you have offered to me, and I am especially appreciative for your helping to start off on the right foot at Hamilton. I’m sure that if you hadn’t been here during my freshman year, the succeeding years would not have been as profitable for me. 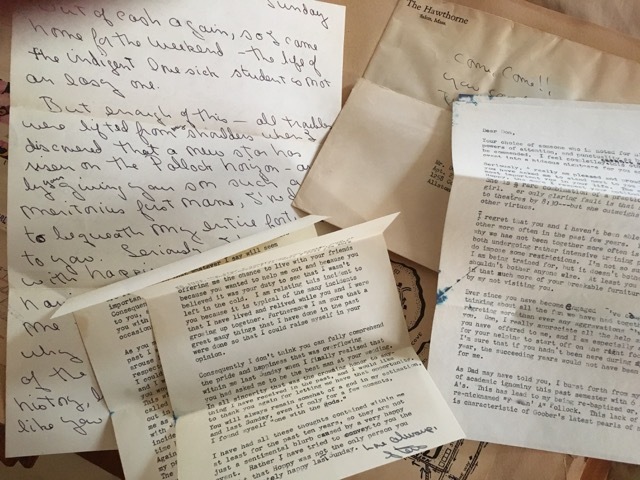 So, for Uncle Stewart, I include one last Hamilton College letter that my father has saved for 70 years. 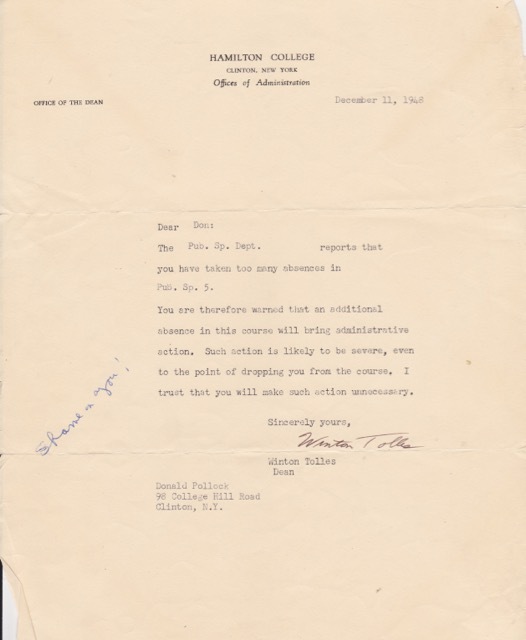 It was in the same folder as the Glen Cunningham letter, and was written by Winton Tolles, Dean. I don’t know who wrote “Shame on you!” but I can almost bet they were laughing as they did. I laugh too, because amid all the accolades, my father saved an academic warning letter. Maybe it’s the only one he ever received. Thank you, Sally, for this memory of your father’s. I, too, attended Hamilton, and graduated in the class of 1981. It is how your brother, Stewart, and I connected, as alumnae, along with Hugh(in my class) and Ben Davis. Your father was still known by professors on campus when i was there, held in very high esteem. Great tributes to him, Sally.